When the average diver thinks of the islands of the Bahamas, the vision is generally of white sand beaches lined with palm trees, finning around the crystal blue waters and fish-filled coral reefs, or the post-dive beach bar where bikini and board-short clad tourists allow the warm Bahamian sun and umbrella-topped rum drinks to evaporate the stresses and realities of life back home. Most of the divers who come to the Bahamas have no idea that some of the best diving in the world is actually under their feet. But divers in the know have realized that the extensive limestone platforms known as the Great and Little Bahama Banks have created a unique labyrinth of blue holes and underwater caves that make the Bahamas a world-class cave diving destination. The list of explorers who have come in and out of the Bahamas in hopes of scooping big cave is long and impressive. 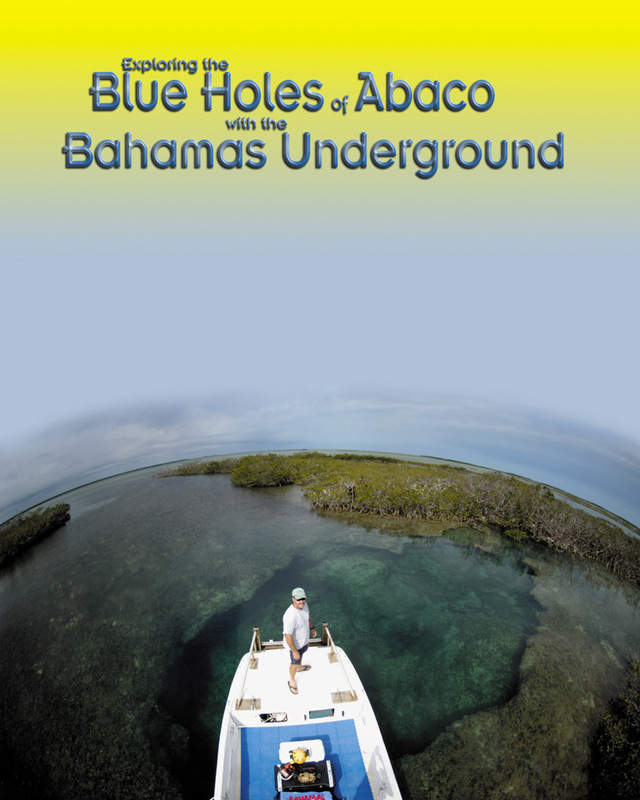 George Benjamin, the Godfather of blue hole diving, British explorers Rob Palmer and Martin Farr, American explorers Parker Turner, Mike Madden, Sheck Exley, and Tom Mount have all left line in Bahamian caves. These divers were lured by rumors of bottomless blue holes, and visions of pushing big, long, and deep systems that are scattered throughout the sun-drenched islands. Brian Kakuk, Explorer and owner of Bahamas Underground floats above one of the many ocean blue holes located around the island of Abaco. In an attempt to equalize tides across the island, these blue holes are known to move massive amounts of water both in and out. Timing is critical when planning an excursion into these ocean blue holes. Great Abaco Island, the northernmost island in the Bahamas, is a short, 40-minute flight from the east coast of Florida, and for the last 50 years has been regarded predominantly as a yachting and fishing paradise. The crystal clear waters of the Atlantic hold scores of fish, while dozens of small, quaint islands called Cays (pronounced keys), to the north and east of the main island, create bays and harbors which are the stuff of picture post-cards. But it is the warm pine forests and shallow tidal creeks of the main island that hold the treasures sought after by so many cave divers. When discussing cave exploration on Abaco, a new list of explorers comes to light. Steve Omeriod, Dennis Williams, Gene Melton, Rafe Palmeroy, Fred Davis, Dan Malone, and Kenny Broad join the list of divers who have pushed into the nearly 100 known blue hole entrances located on or near the island. For these divers, getting equipment to Abaco was generally difficult, lengthy, and at the very least, expensive. 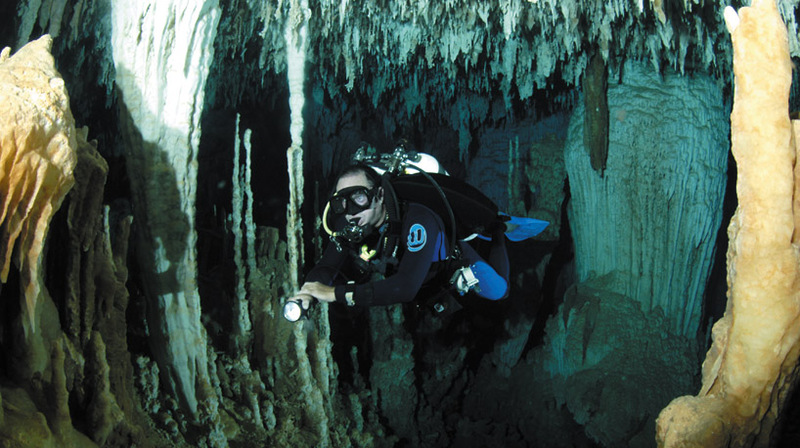 With few exceptions, cave exploration on Abaco has been literally expedition-style diving. Once the equipment arrived, acquiring air fills was usually not too difficult, but obtaining oxygen for decompression was tricky or impossible, and helium for deeper sites was just not available. Getting to the sites required finding a local who would be willing to give up their secret spots. Once new sites were found, a few days to a few weeks of exploration would take place, then the divers and their mountains of equipment headed back to wherever they called home. But the lure of virgin cave is strong, and many of these divers still return every few years to pick up where they left off, or to check out caves that they just didnt have the time to dive on previous trips. It is the many different types of caves found in the Bahamas that makes this island country a must-see destination. Whether you are a visitor or a local, there really are too many caves and not enough time! The blue holes and underwater caves in Abaco are as beautiful and diverse as anywhere in the world. There are generally three types of caves on or around Abaco. 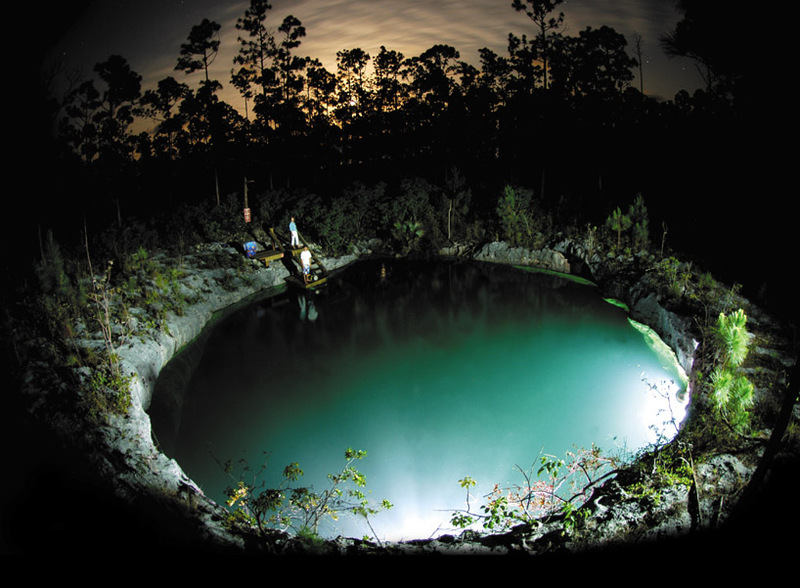 These include sinkholes (known as blue holes in the Bahamas), lens or solution caves, and fracture caves. Any one of these types of caves can also be broken down into two other categories: inland or marine (ocean) caves. The full moon rises above the Abaco pine forest as divers illuminate the greenish waters of Sawmill Sink. There are numerous sinkhole-type blue holes that dot the island. These sites are generally bell-shaped underwater pits that reach depths of 80 feet to more than 330 feet, and may contain cave passages that extend off of the walls or floors. These sinks are where the term blue hole actually comes from, as the water appears to be incredibly blue when observed from the air. This may or may not be the case underwater! The walls of the blue holes are usually heavily decorated with massive columns or stalactites, giving divers a glimpse into the islands geologic architecture. These sites are typically considered cavern dives as sunlight can be seen from anywhere during the dive. Nancys Blue Hole, located in the shallow, clear waters of a mangrove swamp near Coopers Town, has the largest speleothem columns found in the Bahamas. The water in Far Side Blue Hole (aka Magical Blue Hole) is so clear that divers feel as though they are floating in air. Local explorer and cave instructor Brian Kakuk and Swedish cave diver Michael Westerberg recently bottomed out Far Side at a depth of 334 feet using Megalodon Rebreathers and trimix. The entrance of this blue hole, when viewed from the bottom, is a stunning emerald window that looks up and out into Bahamian pine forest that creates a surreal halo around the edges of the hole. Over the years, local hunters have leaked rumors of blue holes with air clear, sweet water within the thick pine forests of the islands interior. These solution caves such as Dans Cave, Ralphs Sink, Sawmill Sink (currently off limits to divers for research purposes), and Lost Reel Blue Hole have incredibly decorated rooms of crystal speleothems, massive rooms and passages as deep as 150 feet. Explorer Fred Davis is currently surveying Dans Cave, and estimates over 17,000 feet of passage in a series of 26 very large rooms. There are areas in Dans that are simply too decorated to continue exploration, so it may never be known exactly how much cave is really there. Ralphs Sink is located just over 2000 feet to the southwest of Dans Cave, and explorer Steve Bogaerts is coming all the way from Mexico to attempt a connection between the two systems. Steve put more than 2000 feet of line in Ralphs Sink back in 2003, and he just knows that they will be connected. The stalactites, stalagmites, columns, draperies, and flowstones are easily the most beautiful in the Bahamas. There are places here where 1/8 inch thick, crystal soda straw formations are nearly 8 feet long! The sheer size and beauty of the rooms of these inland caves can compete with any underwater caves in the world. The ocean caves and blue holes of Abaco are truly natural wonders. These caves are usually fracture or solutional caves, and are located off shore or in shallow tidal creeks and lakes throughout the island. 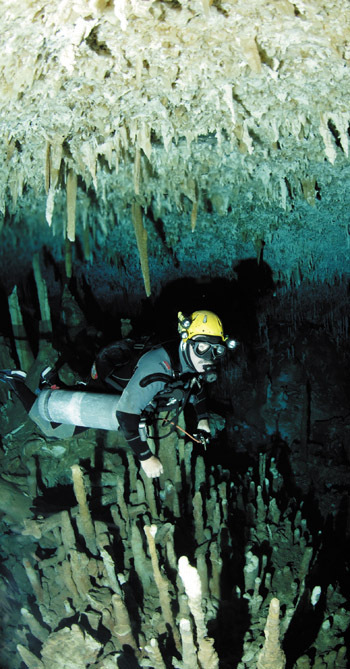 Ocean caves are usually tidally influenced, making cave diving a challenging effort. Each cave has its own lag time (time of slack current) with relation to the tides. As the tides move on and off the shallow banks, and in and out of tidal creeks, the caves act as conduits for the moving water. This means that currents in some of these caves can be so strong that diving during the wrong part of the tidal cycle can have disastrous results. However, diving these amazing systems can be safely accomplished by studying the tides at each site, and documenting the currents in relation to local high and low tides. Local knowledge is paramount, if the dives are going to be done with any degree of safety. The ocean caves are very different from the sterile caves found inland. Some form of marine life is found in literally every crack and crevice. The currents that often intimidate cave divers are literally the conveyer belts of food that support one of the most interesting and diverse ecosystems in the world. The walls, ceiling, and floors are covered with filter feeding animals such as sponges, hydrocorals, tunicates, hydroids, and thousands of other animals all competing for their own little place in the cave. Cat-sized lobsters gather in the entrances of caves such as Reel Breaker, Big Blue, and Star Fish Blue Hole. These tasty crustaceans can also be found foraging for clams, snails, and crabs throughout the passages of the cave. These critters seem to know that by Bahamian law divers are not allowed to capture them while using SCUBA. Clouds of reef fish often gather in the entrances of the caves in hopes of finding a meal being pushed out by the tide. The Bahamas is the only place in the world where cave divers can come up from an awe-inspiring cave dive and out of an entrance that can only be described as an over-stocked aquarium! Deeper into the caves, the web of passages disperses the velocity of the currents. The caves transition from psychedelic, sponge-covered walls to tranquil, decorated rooms where cave-adapted fish and crustaceans rule. New species of crustaceans are found in these systems on a routine basis, making Bahamian caves virtual treasure-troves of new life yet to be discovered. Brian Kakuk prepares for a rope descent into Owls Blue Hole. A massive hole just a few miles from Marsh Harbor. In May of 2006, a new, technically oriented dive facility opened in Marsh Harbor, which is located within twenty to thirty minutes of many of the caves on Abaco. The Bahamas Underground is a cave and technical diving, training, and adventure facility recently opened by local businessman and entrepreneur Michael Albury and Brian Kakuk. Brian is a veteran cave explorer who has been residing in the Bahamas, and exploring underwater caves throughout the islands for nearly 20 years. 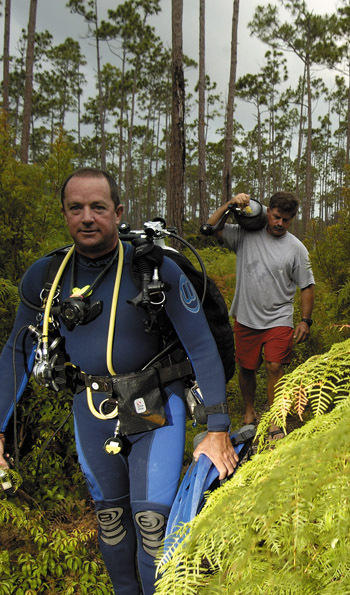 He has been involved in many world-class cave diving expeditions, both in the Bahamas and internationally, and his experience is now being focused on cave research, cave conservation, and running the Bahamas Underground. Hes also well aware of the difficulties that cave divers have had to face in order to explore in the Bahamas, and the Bahamas Underground is his answer to the problem. 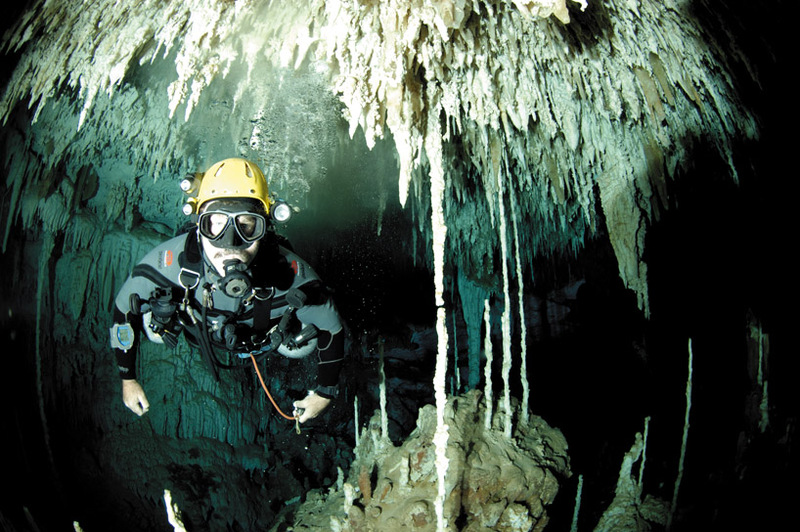 The facility hosts a well-stocked rental equipment program, including double cylinders for cave divers and single tanks for cavern and side mount cave divers. They also provide air, nitrox, and trimix fills, and support both open circuit and rebreather diving on Abaco. Guided diving and transportation is provided to both inland and ocean caves depending on tides, weather, and the clients preference. 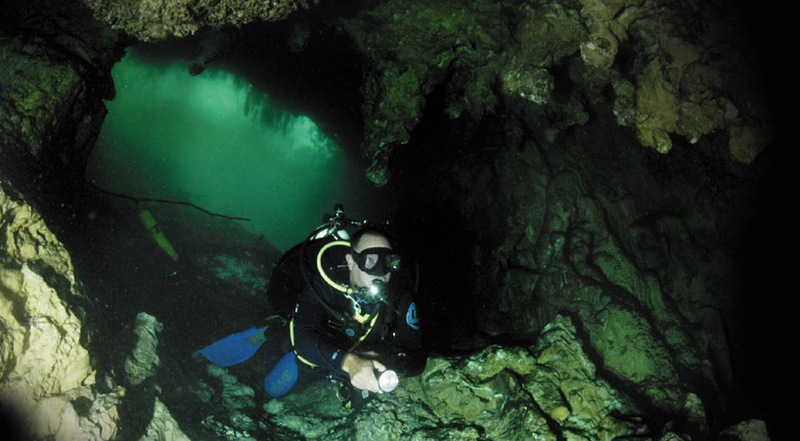 All levels of technical and cave training can be provided, and certifications are earned through the International Association of Nitrox and Technical Divers (IANTD) and the National Association Cave Divers (NACD). Classes are conducted in an air-conditioned classroom, and in-water training is completed in caves, open water, or deep blue holes. One of the great things about Abaco is that it is almost impossible to get weathered out during a trip. Unlike Florida, heavy rains have little effect on island caves. If its too hot to dive inland, then there are dozens of warm ocean blue holes to dive by land, boat, or kayak. There really is nothing like diving in a cave where the water temperature can reach near 90 degrees! In the winter, if its too cold or too windy to dive in the ocean caves, the water temperature of the inland caves is a consistently comfortable 75 degrees. Either way, divers will experience caves unlike anywhere else on earth. The local reefs are accessible through several open water dive shops located in Marsh Harbor and throughout the Cays off-shore, so non-cave diving family members or friends can enjoy a day of open water diving, beach lounging, or shopping in the many shops around town.